Disclosure: This post was sponsored by La Pasta Inc, makers of the perfect pasta for all of your all natural fresh pasta needs. With fun and unique flavors that you won’t find anywhere else, as well as Italian classics, they produce a pasta for everyone, including vegan and gluten-free options! As always, my thoughts and opinions are my own. Pasta salad gets a healthy twist just in time for summer! 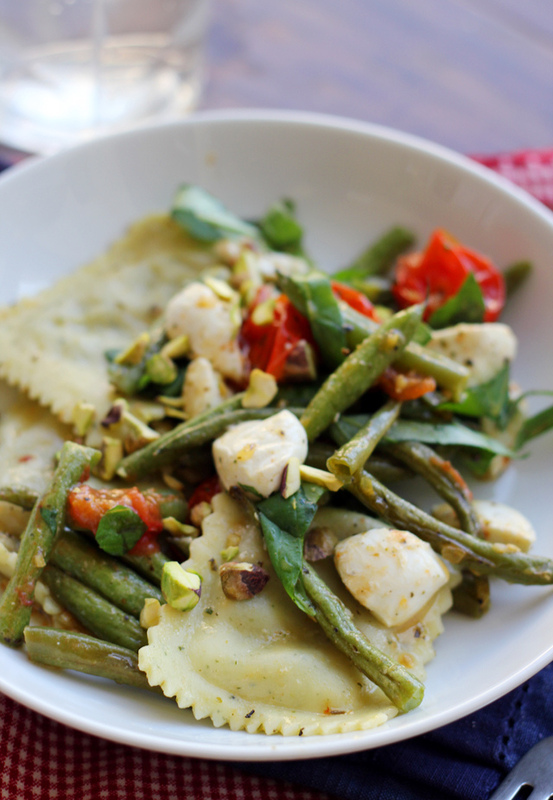 This veggie-loaded roasted string bean, tomato, basil, and mozzarella ravioli salad is feel-good warm weather food. Pasta salad before Memorial Day. Things are getting all sorts of kooky around here. Do people still follow these Memorial Day/Labor Day rules anymore?Like, If I wear white jeans around the Upper East Side tomorrow, will there be a Pretty Woman-esque situation in which all sorts of fashionable establishments will refuse to wait on me because I’m just all kinds of wrong? On the flip side, if I wear white jeans while toting around this salad maybe the other pedestrians will think I’m so off the wall that I’ll finally get some personal space. What’s more likely is that they’ll stick their hands into my salad bowl as they walk on by and pluck a ravioli out for the road. To be honest. I wouldn’t blame them. I’m ready to kick pasta salad season off yesterday if it means I can get more of this ravioli salad into my life. A healthier alternative to the mayo-laden mess normally served when temps hit above freezing, it is chock full of roasted veggies and fresh flavor so it won’t weigh you down as you go about your day. The classic tomato/basil/mozzarella trio gets a bit of an updated feel to it with roasted tomatoes, spicy string beans, and a sprinkling of toasty pistachios on top. It’s kind of the perfect bite, made all the better because you can feel good about eating it. 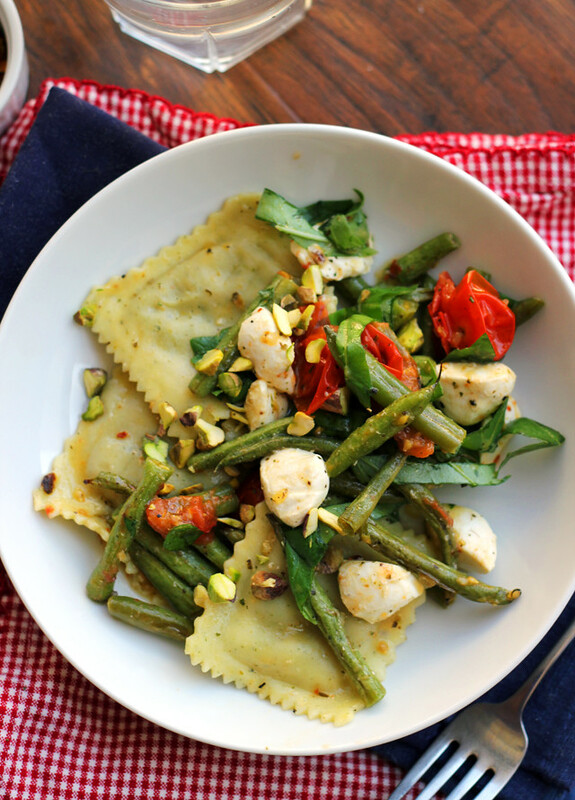 I am extra excited about this ravioli salad because it uses my new favorite brand of pasta – La Pasta Inc – a producer of all-vegetarian, all natural fresh pastas. They feature such crazy fun flavors, like the Sweet Potato, Quinoa, and Kale ravioli featured in this recipe, as well as all sorts of vegan and gluten-free options. Not only could I pronounce EVERY INGREDIENT on the ravioli ingredient list (BIG plus for me), but I was really blown away by it’s great flavor, with hints of sweet cheesy savory-ness in every bite. If you want your pasta salad to be the buzz of the town this year (and not just because you made it a few weeks too early), then it needs to have some La Pasta pasta in it, so look for it in a store near you or try to locate where to find it using their store locator! No matter which of their myriad varieties you choose, you won’t be disappointed. I pretty much guarantee it. 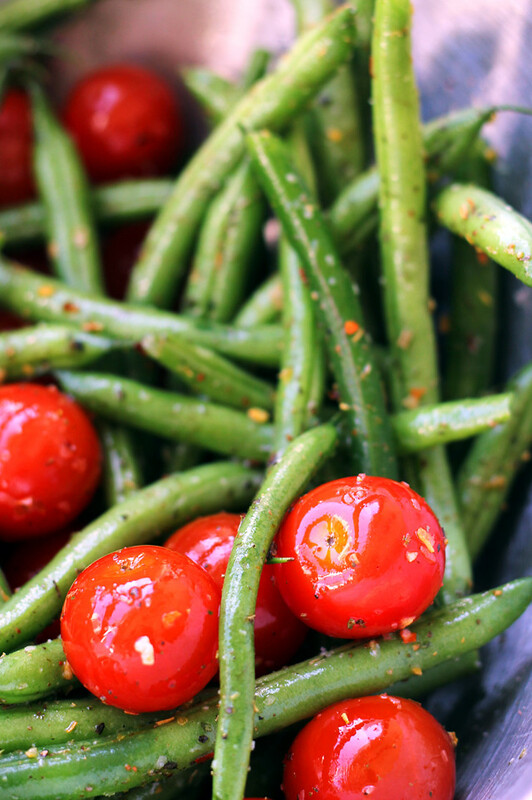 In a large bowl, toss together the olive oil, string beans, cherry tomatoes, Tuscan seasoning, red pepper flakes, and a hearty pinch of salt and black pepper. Spread out on a parchment-lined baking sheet and bake until string beans are starting to brown and tomatoes are starting to burst, about 20 minutes. Set aside. In the meantime, bring a pot of salted water to a boil. Cook the ravioli in the boiling water according to package directions. Drain. In a large bowl, toss together the roasted vegetables, ravioli, mozzarella, and basil. Season to taste with salt and black pepper. Serve topped with the pistachios. Roasted veggies make everything better! And that pasta sounds delish! Will have to check out the brand. What a fun twist with the string beans! Love it! Pasta salad is one of my favorite things about summer, and this one is gorgeous! I wore white pants 2 months ago and thankfully no one bowed their head to whiper or threw paint on me, so I’m going to take that to mean we can break all the Post Labor Day Pant-Wearing Rules. 😉 This pasta looks innnnnncredible! All fluffy and full o’ flavor. Sign me up for the no-mayo-laden mess! Have a great weekend, lady! Why doesn’t everyone make pasta salad using ravioli! Best idea ever. I also did NOT know it isn’t kosher to eat pasta salad year round. so. Oppsies. Sounds like they have a lot of unique flavors. And I’m always down to eat pasta salad. This one looks great! Have a wondefful weekend Joanne! I am ready to wear white pants now too – I love your Pretty Woman reference. 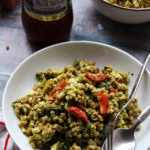 This looks delicious – I love the healthy alternative and those cherry tomatoes look perfectly red! A roasted pasta salad sounds just perfect for any time of year!! This looks mouthwatering. Wear the white jeans! But I’m totally plucking out a ravioli If I see you coming. Pasta salad or any kind of pasta + me in white jeans, or any kind of white clothing = disaster. 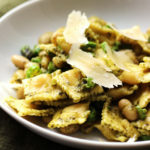 Am not even a huge pasta fan, but everytime I see one of your pasta recipes, I find myself craving it -and very likely to grab a piece of ravioli and a string bean or two off your plate if I bumped into you! Gimme a big bowlful of this beautiful pasta, a glass of wine (pretty soon, at least), and I’m set. 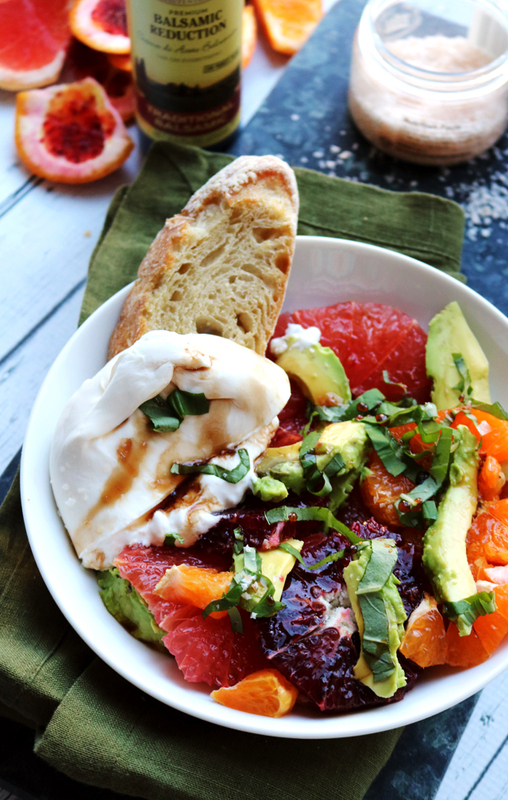 Such a gorgeous, summery dish! 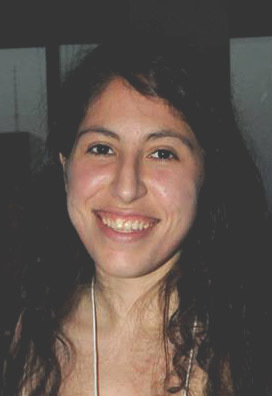 Have a great weekend, Joanne! Pasta salad should never be limited! I actually have been looking for a great fresh pasta option, so thanks for recommending La Pasta Inc. When I break unspoken rules I just blame it on being Canadian. Everyone thinks Canadians are dumb. Ironically Americans couldn’t tell you the capital of Canada soooooo yeah. Roasting has become my favourite way to enjoy the veggies This pasta dish looks like a pure comfort! What a great dish, love pasta salads, a meal in one. Never had green beans prepared this way, I bet they are delicious roasted. Great post Joanne! 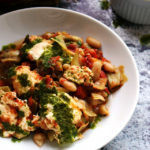 Vegan ravioli is practically impossible to find unless it is squash, and even then they like to add some kind of cheese – so this is a real find. Thanks for the info! La Pasta is sold in Gristedes here in NYC, in case you want to pick some up! Looks really fancy for not too much work, that makes me super happy! Thanks Joanne! 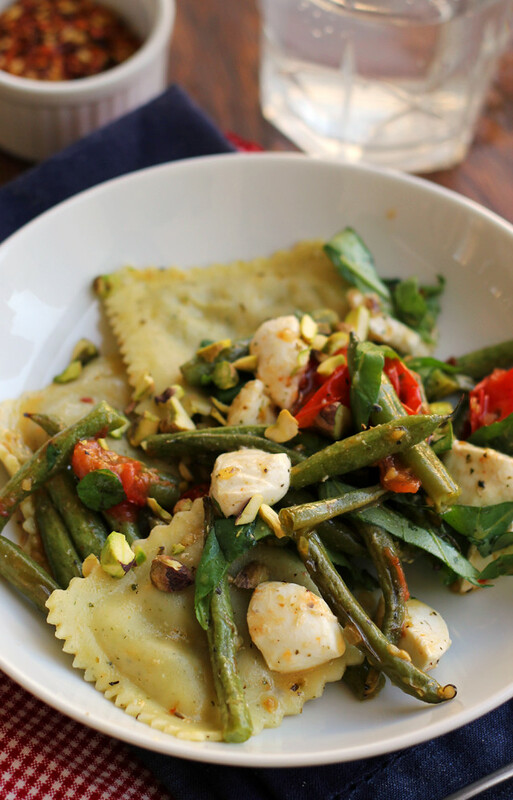 You used ravioli in a pasta salad and I will love you forever because of it. And seriously, I could eat pasta salad year round. Bring it on! There is a very good chance this will be made on mother’s day, namely because I’ve decided not to cook and this looks like something my husband could handle. Love the pistachios! I would have never though to add them but it’s a great idea. This sounds really good! We too prefer pasta salads that are not weighed down with mayo, much healthier! Good job girlfriend !! IDK you are in N.Y. Aren’t you supposed to be super fashionable and follow the rules? 😉 I’ll def be on the lookout for the ravioli! It looks seriously awesome! Why have I never thought to make a pasta salad using ravioli? Brilliant! 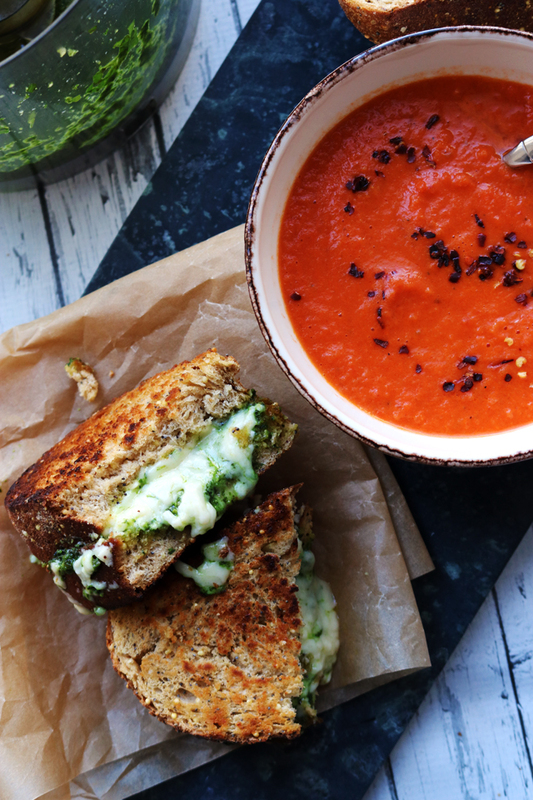 This pretty much looks like the perfect lunch! I say go for the pasta salad, go for the white pants, yolo! If anywhere still follows fashion rules, NYC is the place…but I would go ahead and wear the white jeans anyway. Blind the onlookers with your fabulousness! 🙂 And this salad looks fantastic. I definitely need to get my hands on some green beans and bocconcini! 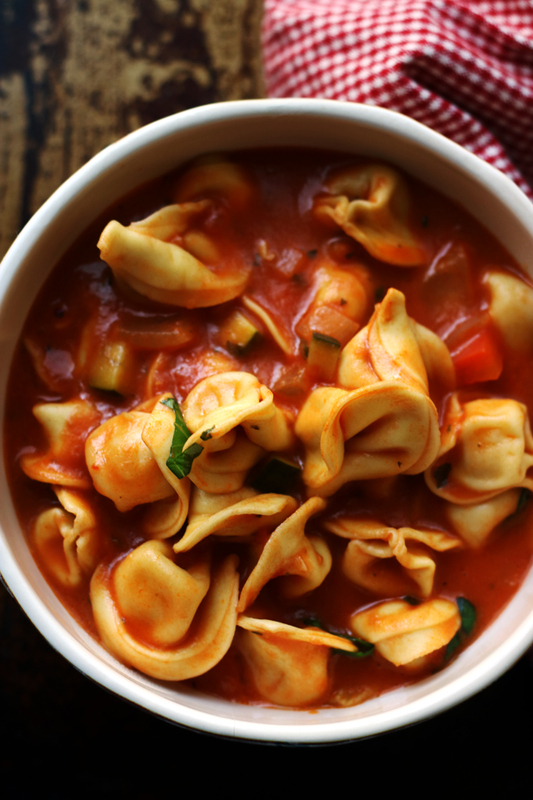 I feel like I’ve seen a lot of “filled” pasta salad this year – ravioli, tortellini, etc. What a great twist. This salad is definitely having me crave for summer to begin now!! I want this. Right. Now. Seriously. Have to go shopping tomorrow and after looking on La Pasta’s website, yay, Whole Foods carries them! Joanne, this is delicious looking. I don’t even know what the Labor Day rules are!! Sooooo no, we don’t follow them, but they seem pretty hilarious! There’s nothing funny about this pasta though – pure deliciousness! I think if I were walking by you, I would take the whole thing and run. This looks so good! This is so pretty, love all the vegetables in it too. my kind of pasta salad- chock full of delicious veggies! Wow, this looks amazing Joanne! 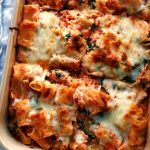 I love ravioli- definitely need to try this recipe out soon! Would make a great addition to a Summer picnic! I love the colors of this salad! 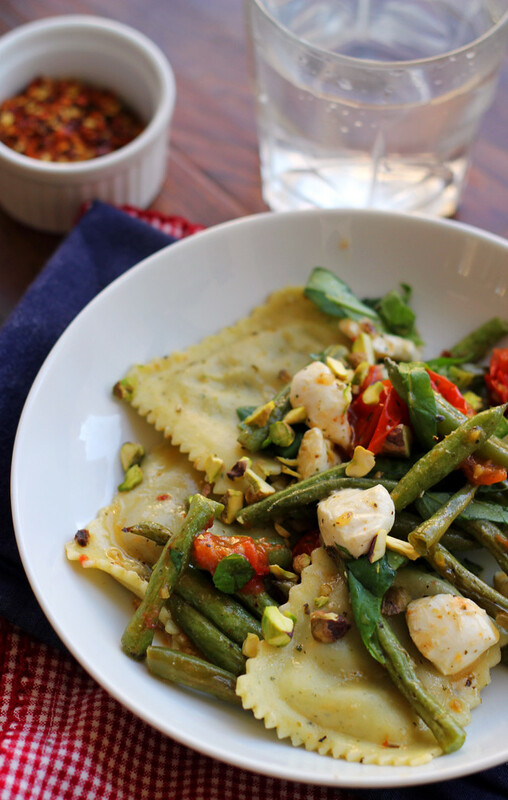 Ravioli + roasted vegetables = amazing! 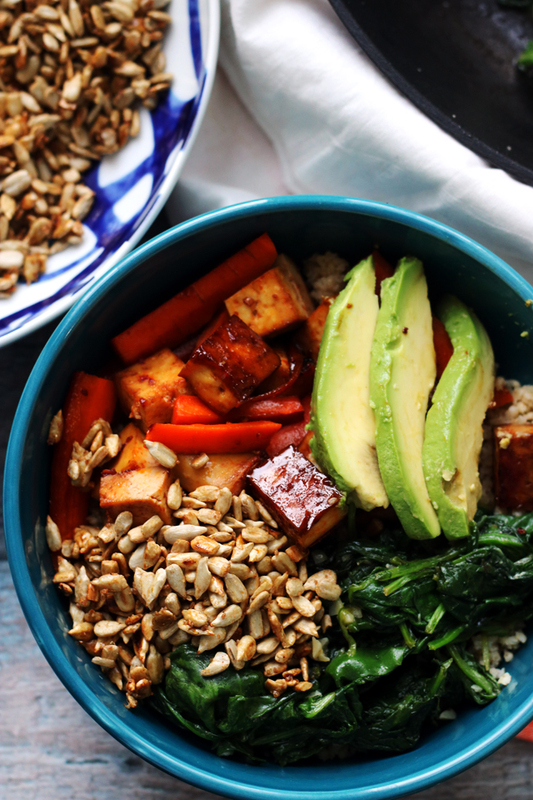 I can’t think of another way I’d rather eat my veggies then roasted…this salad looks wonderful!! Have a great weekend, Joanne! After seeing this pasta salad, I would agree let the pasta season begin! great looking spring salad! love the ravioli! I didn’t know they made a quinoa ravioli. Please let me know which brand I really want to try it! That’s a mouth watering salad! Being a food blogger Living in CA can be a burden when the rest of the world is still eating heavy casseroles and you’re eating popsicles and pineapple granita. Small price to pay, I know. Bring on the salads! Love this one. Personal space on the sidewalks of NYC? Keep dreaming!! But if you were walking with a plate of this salad I might stop and take a bite 🙂 It look so amazing! I’ve never thought to do a ravioli salad, but it is such a good idea!! And I say, rock those white pants!! And never have had roasted string beans! This look so good!! My hubby would love this….as would I! I simply like the roasted string bean and tomato combination on the ravioli and always love a salad like this as a meal.